Robins Bring the Hope of Spring and that changes everything! The Robin and The String – Again! It was a lesson in tenacity! You’ve heard of bulldog tenacity? Well, this is Robin tenacity. One 10 ounce bird and her determination to build her house. A few weeks ago I was looking out the bathroom window, early in the morning. It was light out but the sun wasn’t quite shining in our valley yard. Out the window is a white lilac bush with a shoot of growth about eight inches from the main trunk. The shoot is tied to the larger bush with a cotton string tied in a tight bow. Mrs. Robin was on the grass under the string. She would jump up, grab the cotton string and fly off; however, she would only get about a foot because the tied string would not allow her to fly off with it. She did this exercise about ten times and finally gave up and flew away. My husband joined me at the window and we were cracking up! This little episode would have won first place on America’s Funniest Videos and was definitely a good lesson in tenacity. When my children were little one of our favorite books was The Best Nest by P.D. Eastman. Perhaps you are familiar with it. Mrs. Bird becomes dissatisfied with her nest and leaves it in search of a better nest – Mr. Bird frantically searches for her all over the countryside and finally during a thunderstorm he finds himself at his old nest and lo and behold, Mrs. Bird is sitting there on a couple of eggs, singing: I love my house, I love my nest, in all the world this nest is best! A story with a great message of being content with what one has. Getting back to our own Mrs. Robin – I took a piece of loose string and went out to the lilac bush and draped it over the tied piece, leaving it loose and available. I was hoping to see our feathered friend come back and victoriously grab the string one more time and fly off with it. I never did see her come back, but come back she did because the next morning the loose string was gone. Hmm…is there a lesson for me in this bird story? How many times do I try and try to do something similar to pulling a secure, tied string from a branch – knowing full well after two or three tries that “the thing” is not going to budge? And then in my frustration and defeat, my (heavenly) Father, who has watched my struggle, comes along with His grace and mercy and places a loose string for me to fly away with? Friends, I hope we all learn the lesson to be tenacious in our efforts. Keep on keeping on – that loose string may be the next thing within our reach and then we will FLY! This is incredible. The LORD put a “never quit” attitude in mama’s, that’s for sure. Love reading this, so much truth. Thanks Susan! Kris, this is an old post but one I enjoy posting in the Spring!!!! Love it! And how cool to find a nest with a string it in by accident. But yes, we always need to be willing to try again when the Lord asks. Even if we’ve failed at something before, He might have changed something, making sure we are successful. We never have to truly give up with Him by our side. You are so right, Jen! It was remarkable to find that string woven into the nest!! Great post and loved the photo! Thanks ROBYN, for reading my ROBIN story!!! What an awesome story! I can just imagine the persistent bird trying to fly away with a string :). I love observing birds–they are so amazing. 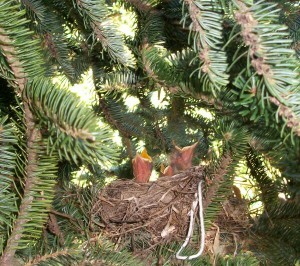 And, THEN, to see the string in the nest!!! Thanks for reposting this beautiful story! I have always loved watching the birds, and the lessons they teach us about life. God is so good to bring HIS beauty and truth to us! Thank you BettieG – it is definitely one of my favorites!!! be tenacious in our efforts, keep on keeping on.. yep, totally needed to hear that today… someone else told me just today, to just keep swimming, swimming, swimming. Thanks for sharing about the tenacious Robin – all 10 ounces of her. & Thank you for linking up with #TuneInThursday today! And,thank YOU, DK for coming over to my house! What a sweet story and a beautiful lesson :). Love this. The Lord just gave me a loose string yesterday and the day before He showed me a string that had already been woven into the tapestry of my life — one I hadn’t even noticed. I saw your FB post and I’m waiting to hear about your “strings.” Private message me PLEEEEZE. What a lovely story of trust and hope! May we all learn well and trust God for all we need! Look at the birds of the air! They neither plant or harvest or store food in barns………..are we not of more value? Susan, I am so glad you shared this again. I LOVE seeing robins as they speak of hope to me. And so did this post! As He imparts His strength to us, we can be tenacious and keep on. Robin Tenacity. I’m with you! I enjoyed this story, Susan! So ready for spring here in the Midwest too. Loved this! I’m hanging on to the promise of warmer days and sunshine! Amen, holding with you, sister. I LIKE IT. Strings of Hope. So cool to see that string gift hanging from the nest. Thanks for this lovely parable. Susan, what an amazing photo! I can hardly believe it. Amazing what we can learn from the world around us, how God speaks to us. I’m going to keep on keeping on! I’m glad my post brought a sense of childhood nostalgia today, Valerie. Well, I was going to write a thought here, and then I saw my reply from a year ago, with almost the exact same thoughts! I guess I am just a re-post reply-er! ha. Still love this post! Bettie, I’m glad you read it again! Dear Susan, what a charming story, and a lesson that never grows old. Thanks and blessings for this breath of spring!